The Tate Britain’s latest exhibition is a momentous retrospective, spanning almost 30 years, of British Turner Prize-winning artist Rachel Whiteread. The exhibition brings together a variety of pieces from Whiteread’s defining years as an artist alongside work made specifically for this show and shipped just a few weeks ago. The work explores the body, space, life and death; some are the size of stairwells whilst others resemble hot water bottles. This exhibition is not to be missed. Before you even reach the gallery, a recent 2017 piece Chicken Shed can be found sitting in the West Lawn of the Tate Britain (it is the only piece you can actually touch). Inside, as you approach the exhibition, coloured resin casts of the undersides of a hundred chairs sit in careful configuration along the belly of the entire South Duveen Gallery. Even the surrounding works by Sarah Lucas and Barbara Hepworth, amongst others, are carefully selected by Whiteread herself in the buildup to her own exhibition. It is as though, just as Whiteread’s individual works inhabit spaces, her retrospective inhabits the Tate itself. Upon entry to the exhibition itself, the first room is a long introductory space exhibiting pieces from Whiteread’s working processes. Photographs, models, paraphernalia and a small-scale model of her Trafalgar Square public commission from 1999 all sit alongside images of dilapidated buildings and a video documentary of House (1993), the career-defining piece that won her the Turner Prize. The main gallery space lies beyond frosted doors at the end of this corridor. Ghosts inhabit this space: objects that have been cast in industrial materials to create inversions of themselves. The original object is often destroyed, leaving behind an imitation of what already existed. This process ignores the precision and calculative intricacies of an object in favour of the wear and tear that shows up in these careful reproductions. The room’s most dominating works sit either side of its centre. Untitled (Stairs), standing almost four metres high, is a stairwell – cast in plaster, fibreglass and wood – reminiscent of Escher’s mind-bending lithographs. Meanwhile, the huge Untitled (Room 101) casts a conference room at the BBC Broadcasting House that is thought to have inspired the chamber of the same name from dystopian novel Nineteen Eighty Four. Three sets of bookcases sit at the centre back of the space, beckoning you to walk between their aisles. Other casts are spread around these – everything from a doll house, Ghost II (2009), to a typical mattress, Shallow Breath (1988) – and the room is filled with the inverted bodies of everyday objects, all of which evoke an understanding of the spaces we inhabit. Circling around these large-scale casts are various other bodies. Colourful resin casts of doors and windows lean against the white gallery walls as if ports to another place. Mattresses cast from rubber and urethane slump against the walls and act as evocations of sleep, space and the human condition. Torso (1988) sees various hot water bottles sit in glass viewing chambers, all cast in a variety of industrial materials from plaster to rubbers and resins, and each personified by their strangely human form. Placed discreetly to the side is a space dedicated to the methodology of Rachel Whiteread. Paintings and drawings, plans of pieces before their construction, are done predominantly on graph paper to illustrate their future piece’s significance and to document their births. A room full of moments or, as Whiteread previously suggested, a mummification of the air. Whiteread’s work explores the liminal space between an object’s life and its death. By casting these pieces she births a new significance in the object, while the works themselves become graves shaped by the skeletons of their subjects. It is the quiet psychological power embodied by the work that makes this exhibition so stunning to witness; a meditation on the structures and forms we surround ourselves with. 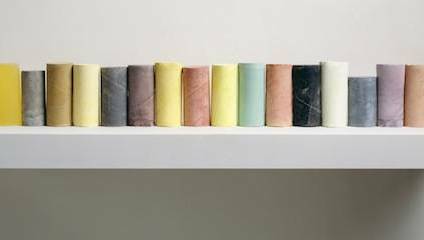 Rachel Whiteread runs at the Tate Britain until 21 January. Tickets cost £15.